Context Clues: People don’t have tails… BUT CATS DO. Even though she was referring to foxes in the song, it’s all too obvious who she really means. Song: “All Too Well”, Red. Context Clues: Cats are destructive creatures, and as you can see above, will chew, tear, and scratch just about anything. Context Clues: Every cat owner knows that your cat is your alarm clock, whether you want that or not. See the video below which proves Taylor’s cats make no exception for superstars. Thus, according to the song, after Taylor walks out and says “I’m setting you free” to whomever the REST of the song is about, she very well probably went home, had a nice sleep in her own bed, and woke up to the face of her cat wanting food. 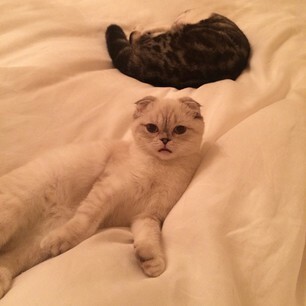 Evidence #4A: Cats waking Taylor at 6am. Song: “Everything Has Changed”, Red. Context Clues: This is clearly about Meredith’s adoption. 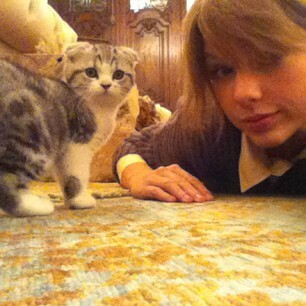 Taylor meets Meredith, takes her home, and her life has been different ever since. Context Clues: This entire song could arguably be an ode from Taylor to Meredith, after bringing Olivia into the family. 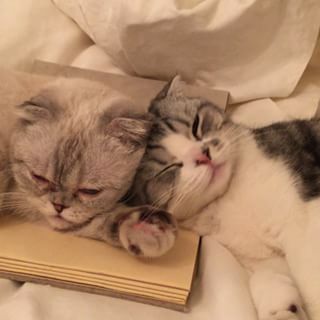 It undoubtedly broke Meredith’s heart to discover she was no longer Taylor’s one and only, and as stated in the caption above, the two felines had “hourly fights” in their beginning days. 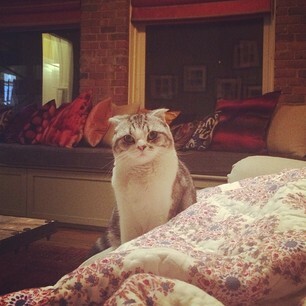 But Taylor needed Meredith to know that she still wants her, forever and ever. And here they are, a happy, cuddly family. Context Clues: Olivia has two blue eyes. Taylor has two blue eyes. 2 + 2 = FOUR BLUE EYES. OK, OK, this was written before Olivia’s time, but shhhhhhhh. Context Clues: While not directly about Meredith considering she’s a female, in this lyric Taylor is using her cat for a metaphor. Meredith is dark gray, thus Taylor connects the concept of missing something with that color, as she misses Meredith deeply when not in her presence. 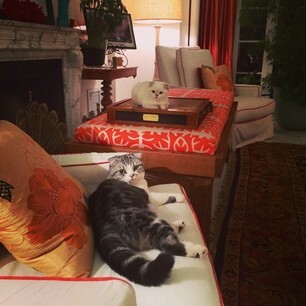 Context Clues: Meredith spent some time as the only cat in the family before Taylor introduced Olivia. Many pet owners must think long and hard about the time and energy they can invest in another pet. But when Taylor saw Olivia, chances are she couldn’t think of anything other than taking her home. Olivia could have been evil, thus the wording of ‘my next mistake.’ I’m sure Taylor has since realized it was no mistake. Context Clues: Taylor is getting historical here. Cats were once wild and have been domesticated, aka ~trained to get along~ with humans. 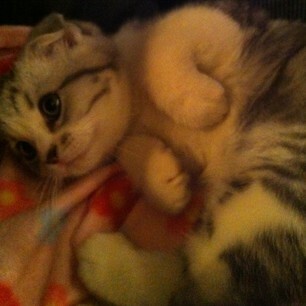 And according to the laws of science, we can assume the fur on Meredith creates some friction whilst being pet. Context Clues: Cats can be rather nocturnal beings, and will be awake at certain times of night. 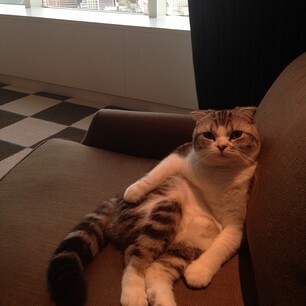 The above picture clearly shows Meredith sitting in her chair…BY A WINDOW, LOOKING OUT AT THE CITY. And as stated previously, Taylor cannot be with her cats as much as they’d like her to be. Song: “I Wish You Would”, 1989. 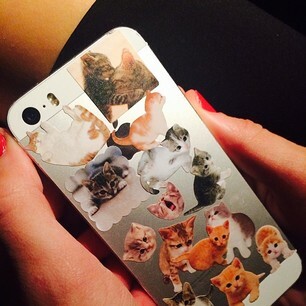 Context Clues: Taylor is on the road a lot, and can’t always bring her cats with her. As we know from the famous Leg Scratch Instagram (pictured below, #12A), her cats are not above using claws when they are upset. The above Instagram is what happens when Taylor has been away from her cat for too long. Put two and two together, and it’s blatantly obvious that Meredith or Olivia may have scratched Taylor, causing her to leave on a bad note…but after a while she knows she loves them so much she can’t possibly be mad anymore. Evidence #12A: A cat scratch to the leg. Context Clues: Taylor loves her cats, and literally says this ALL THE TIME.